Electromagnetic flow meters are intended for industrial measurements of electrically conductive liquids in different fields of industry. Electromagnetic flow meters meet most demanding requirements on accuracy, reliability and long-term stability of measurements. Liquid flow rate measurements in both directions of flow are possible. The FLONET FN20XX.1 induction flow meters of the FLONET FN20XX.1 series are intended for the professional application and measurement of flow rates of electrically-conductive liquids in water and heat-supply systems in the food-processing and chemical industries. They meet the most demanding requirements for high accuracy measurement, long-term stability and hygienic standards. The converter provides the sensor with energy and allows for the processing of sensor signals, and also offers liquid batching control, empty piping detection, internal meter status diagnostics, automatic counter cleaning and selection of flow unit functions via data visualization. The flow meters have frequency, pulse and current outputs, as well as interfaces to the RS 232 and RS 485 communication lines. 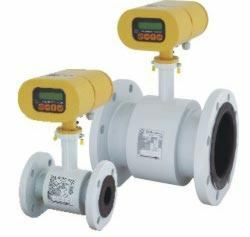 The FLONET FH10XX.1 induction flow meter series is intended for the professional application and measurement of flow rates of electrically-conductive liquids in water and heat-supply systems in the food-processing and chemical industries. They meet the most demanding requirements for high accuracy measurement, long-term stability and hygienic standards. The converter provides the sensor with energy and allows for the processing of sensor signals, and also offers liquid batching control, empty piping detection, internal meter status diagnostics, automatic counter cleaning and selection of flow unit functions via data visualization. The flow meters have frequency, pulse and current outputs, as well as interfaces to the HART communication protocol. Induction flow meters of the FLONET FH20XX type series are intended for professional application and measurement of flow rates of electrically-conductive liquids in water and heat-supply systems, food-processing and chemical industries. They meet the most demanding requirements on high measurement accuracy, long-term stability and hygienic standard. The converter provides for sensor energizing and processing of the sensor signals, and also offers functions of liquid batching control, detection of empty piping, internal meter status diagnostics, automatic counter cleaning and selection of flow units in data visualization. The flow meters have frequency, pulse and current outputs, as well as interfaces to the HART communication protocol. The FLONET FS10XX induction flow meters of the FLONET FS10XX series are intended for professional flow-rate measurements of electrically conductive fluids including abrasive particles. The meters meet the most demanding requirements regarding measurement accuracy and long-term parameter stability. Flow-rate measurements in both directions are possible. The flow sensors have excellent wear resistance and its effect on the fluid flow or pressure in the connecting piping is negligible. The associated electronic unit supplies power to the sensor unit and processes the flow-rate signals. The meters have current and frequency outputs. The HART communication protocol is used to communicate with external devices. 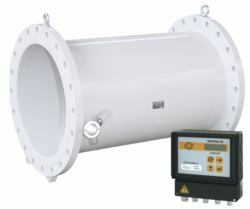 The FLOMIC FL3005 ultrasonic flow meter is designed for the convenient measurement of instantaneous flow rate and flow volume values on large-diameter pipelines up to 2000mm; the measured data are easy to read, and the meter itself is very reliable and requires only simple maintenance procedures. The FLOMIC FL3005 is installed directly into the existing pipeline and theoretical calibration is made after installation. It is equipped with an internal battery and can be installed anywhere without available external power. The FLOMIC FL3085 ultrasonic flow meter is intended to measure and store instantaneous flow rate data and the total volume of liquid passed through the metering point in fully-flooded piping of large sizes. The only requirement of the measured fluid is that it allows for the undisturbed propagation of ultrasonic waves. High accuracy measurement is achieved thanks to the calibration of the flow meter performed on a test rig. 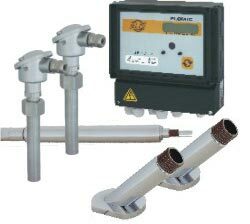 The FLOMIC FL3085 flow meter does not require an external power source. It is equipped with an internal battery and can be installed anywhere without available external power. The guaranteed battery life is 4 years. Apart from the measurement and visualization of data on the instantaneous flow rate and aggregate volume of the fluid passed through the meter, the electronic accessories of the meter make it possible to store the data measured at regular intervals in its own data log and to communicate data via standard electrical outputs to a master control system. The FLOMIC FL5054 ultrasonic water meter solution for detecting water leaks. 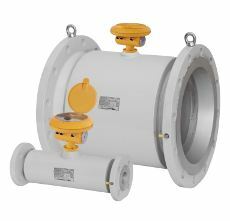 The battery-powered FLOMIC FL5054 ultrasonic flow meter is intended to measure instantaneous flow rate, pressure and consumption in water piping observing the EN 14154 standard in water works, water distribution systems and other industrial applications. 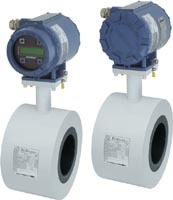 These meters use a dual-beam transit-time pulse measurement method based on evaluating the time needed for an ultrasonic signal to cross the distance between two measuring transductors. In the standard version, the meter measures instantaneous flow rate (in m3/hour) and the total volume of water passed through the meter (in m3) in the given flow direction. The data measured are converted into passive pulse output signals. The meter output signals can be connected via data transfer systems to remote computer control stations. 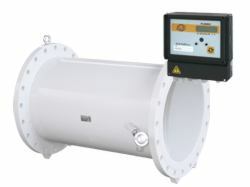 The flow meter electronics also include data storage with various connection possibilities (GSM module, RS232, optical data probe). This feature can be useful for measuring distant points without electricity. FLOMIC FL 50X4 flow meters can effectively save customers money everywhere water needs to be measured and it is impossible or too expensive to connect to the power grid. The SONOELIS SE402X and SONOELIS SE4025 dual beam ultrasonic flow meters are intended for flow-rate measurements of conductive, non-conductive and aggressive liquids. The SONOELIS SE402X and SONOELIS SE4025 dual beam ultrasonic flow meters are intended for flow-rate measurements of conductive, non-conductive and aggressive liquids. Ultrasonic flow meters operate on the principle of measuring the difference in transit times of ultrasonic waves travelling in and against the fluid flow. Ultrasonic flow meters offer excellent user value in their high accuracy measurement over a wide range of measured values, long-term stability, negligible hydraulic losses and the ability to measure the flow rate of virtually any liquid medium. The electronic control unit of the meter can be configured in the COMFORT mode, according to customer requirements. 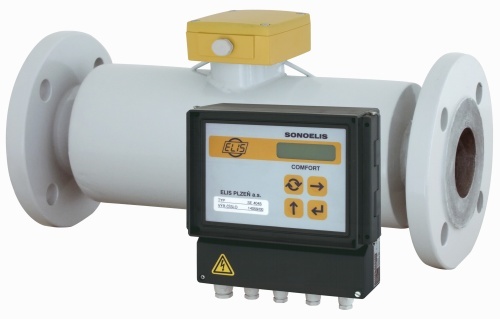 The SONOELIS SE406X dual beam ultrasonic flow meter is intended for measuring conductive, non-conductive and corrosive liquids in various industrial environments. The meter consists of a flow sensor and electronic control unit, providing power for the ultrasonic probes. The meter is noted for high accuracy over a wide range of measured values and long-term measurement stability. The meter is available in two design versions - compact and remote, and the associated electronic unit can be configured according to the customer’s specification in either the ECONOMIC, STANDARD or COMFORT mode. The SONOELIS SE 804X single beam ultrasonic flow meter comes with ultrasonic probes fitted directly in the piping. The probes measure the instantaneous flow rate and total volume of liquid passed through the sensor in large-size, fully-flooded pipes. The measurement principle makes it possible to measure all types of liquid media in which the propagation of ultrasonic signals are reasonably well provided for, including electrically non-conductive and corrosive liquids. To ensure high accuracy measurement, theoretical calibration is performed after the meter is installed in the piping. The meter’s electronic unit can be configured in either the ECONOMIC, STANDARD or COMFORT modes, according to the customer’s requirements. The SONOELIS SE 806X dual beam ultrasonic flow meter comes with ultrasonic probes fitted directly in the piping. The probes measure the instantaneous flow rate and total volume of liquid passed through the sensor in large-sized, fully-flooded pipes. The electronic unit of the meter can be configured in either the ECONOMIC, STANDARD or COMFORT modes, according to the customer’s requirements.